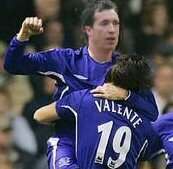 It would certainly interesting to see the childhood Evertonian lining up in a Merseyside derby against the club where he is known as God. Fowler is available on a free transfer, but a drop down to the Championship or a move to Australia or the States seem more likely than a move to Goodison Park. Upton Park is no longer the Argentinian Embassy and is rapidly becoming the Newcastle United Old Boys Club. With Craig Bellamy, Lee Bowyer and Scott Parker already with the Hammers, simply add Woodgate and Dyer and light the (claret and) blue touchpaper. It would certainly give the Los Angeles derby a bit more spice if Beckham was joined in Tinseltown by his former Real Madrid team-mate. The red-and-white half of LA have the Latin American links to suit Raul, but it is doubtful the Spaniard is willing to head to the Hollywood Retirement Home so hot on the heels of Becks. This one is actually a possibility. Nice reportedly want more money than Celtic have currently offered, but the move is not dead just yet. Pies urges the Nice hierarchy to let the move go through in the name of comedy as it would allow Celtic to play a potential back-three of Naylor-Balde-Fanni! Any transfers you would like to see this summer, Pies fans? Sorry to burst your bubble, but unless Raul wants to play for less than $325k/year; he isn’t going to Chivas USA. Chivas USA traded their designated player spot before this MLS season to the Red Bulls for midfielder Amado Guevara. The Red Bulls used the extra slot to get Juan Pablo Angel, a striker who has been lethal for NYRB. Guevara played like 4 games for Chivas USA, refused to go to Toronto for a trade, and went back to Honduras. What I’m trying to say is that if C-USA were smart, they would have kept their DP and could do that – they could use another striker up top to help work with Maykel Galindo. Fowler to Everton? blasphemy against god! Fabregas and Wenger to Barca? How about Ashley Young to Spurs for a potential forward line up of Young, Bent and Keane!!! Yeah, like spurs need another forward!?!? It’s time they got a big name centre half, Materazzi maybe? Its a joke – read it again – Young BENT and Keane (Keen)????!!!!! Naylor – Balde – Fanni, absolute brilliance!! Anyone heard this rumour? Absolute garbage. The News Of The World really is a disgrace. It just makes stuff up on a whim.